How kind of you to do online research for me while I’m on vacation! Chris Kelsey sent in this link to Florida polymer painter Debortina, Deborah Groover. 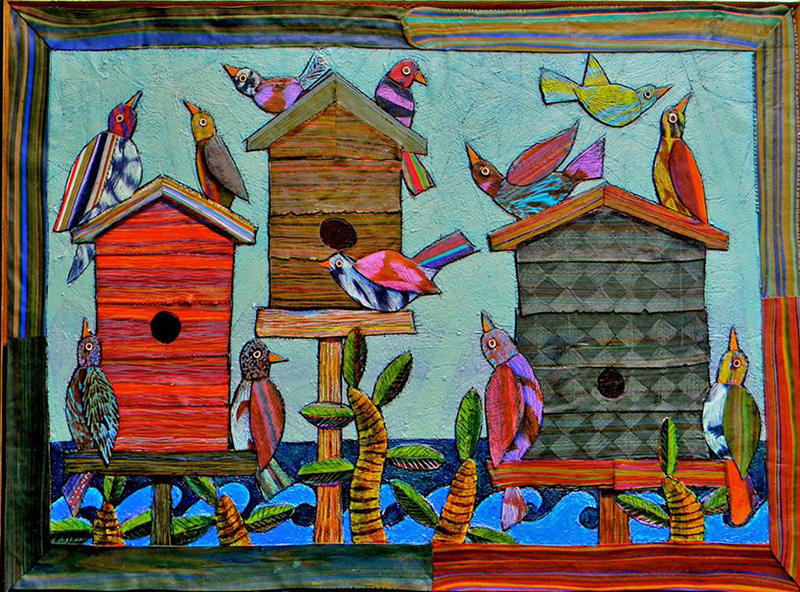 Your eyes will flit around like these Beach Party birds, checking out the wealth of patterns and colors pieced together into larger images. To give you a size idea, the work shown here is 22″ x 32″. The process comes closest to applique. Deborah explains, “Once my clay is heat set, I cut apart sheets and reassemble them into a polymer collage. I then add color and washes, use sgrafitto to remove color then add more color, and on and on until I am satisfied. The backgrounds are not clay (except for the small ones). I use layers of ink pens and paints to create the texture.” Experience the whole shebang on Flickr. Vacation is lovely! Class begins on Monday and maybe I’ll try polymer painting! Wow! Amazing story and work. I’m a polymer appliqué artist myself, and this work of art just blows me away! The time, love, and dedication to detail really comes through:) LOVE IT! Her “Horse lover” piece is probably my favorite – but all of her work is amazing and so inspiring. Great find! How do I contact you about your work?